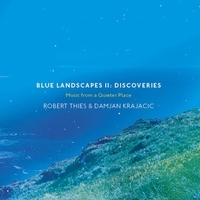 Blue Landscapes II: Discoveries is the follow-up to Robert Thies and Damjan Krajacic’s 2012 album, Blue Landscapes. A world-renowned classical pianist, Thies began improvising and composing at a young age. Flutist and guitarist Damjan’s background spans jazz, Latin jazz and classical along with musical influences of his own central European heritage. Comprised of fifteen compositions spanning seventy-seven minutes, the duo employ melodic improvisation to create blissfully serene soundscapes, as the pieces subtly fluctuate between atmospheric passages and minimalist contemporary instrumental tunes. The opening piece, “Floating”, immediately imparts a mood of repose, leisurely drifting along like clouds slowly passing across the sky with flute and piano emitting softy woven textures. Taking things up a notch is “Across the Open Fields”, a more contemporary instrumental piece that pleasantly recalls the signature sound of many classic Windham Hill releases. Guided along by a continuous piano riff throughout its course, the joyfully carefree tune aptly portrays a scene of riding through open fields and winding around the hillsides, as flute and piano exchange brightly buoyant notes. One of my favorite pieces herein is “Discoveries”, which bears some reminiscence to the film score compositions of Mark Isham. Underscored by a pensive piano loop in contrasting lower and higher registers, I’m reminded of a train travelling in the night, as echoing acoustic layers and textures further accentuate the piece’s beautifully intriguing balance of serenity and suspense. Another highlight, “Evolution”, recalls enchanting woodlands with its fluttering flute and warm piano notes effectively evoking the peaceful solitude of nature. Fey-like and magical, it’s easy to envision being surrounded by colorful butterflies dancing on the wind and golden sunrays pouring through treetops. My absolute favorite piece herein is “Winter’s Chill”, in which acoustic-ambient sequencing underlies a somewhat plaintive flute melody and sparse piano chords. Hauntingly emotive, it seems to allude to that of embarking on a long journey, with wind-tapping effects on flute effectively mimicking that of a chill winter breeze. Closing out the album is the aptly-titled “Dreaming”, where softly swirling piano notes are joined by subtle flute, as both instruments are played with a delicate touch that seemingly recalls a watercolor painting in pastel hues. Gently shifting from the deeply serene to the lightly joyful throughout, Blue Landscapes II frequently evokes the pristine beauty of nature and changing seasons. Never bombastic or overwhelming, the duo inject just enough space between the notes of these gently understated compositions, which are often freeform and flowing yet cohesive and melodic. Often recalling the works of Mark Isham and Paul Winter with even a touch of Michael Jones, Blue Landscapes II is a highly impressive album that will likely appeal, especially, to fans of the aforementioned artists!